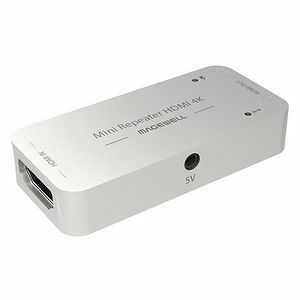 The repeater receives and equalizes an HDMI signal and outputs it to another HDMI cable. It ensures clear delivery of 4K/2K/HD signal over a longer total length of cable. When a capture card directly captures the signal and it shows black-and-white dots (random digital noise or dropout), or the Properties panel reports "no signal" or "unsupported signal", you can try using the repeater. It can fix the corrupted signal at the receiving end, or generate a better signal at the sending end, so that the user can capture the image correctly. However, if the signal is seriously corrupted, the repeater might not solve the problem. The optimum place for the repeater is typically midway between the source and the capture device. If a long cable is not delivering a stable signal, try replacing the long cable with two shorter cables, with the repeater connected in-between them.